A very beautiful ballad! It's excellent to hear something acoustic from them for once and away from the heavy productions. It's a little disappointing it probably won't be as commercially successful as their other songs. The Ed Sheeran influence is very evident. Unfortunately it gets a little boring in over time due to the lack of a climax. One of the better songs off Take Me Home along with Live While We're Young. finds mutig, diesen song als 2. single auszuwählen. aber es zeigt, dass sie wirklich singen können. schöne ballade, natürlich von ed sheeran geschrieben. Pretty nice but gets boring towards the end, More Than This was a way better ballad. Angenehme Ballade, die tatsächlich komplett anders klingt als ihre doch ziemlich überproduzierten Popsongs zuvor. Keine Begeisterung, aber zumindest ein gewisses Interesse meinerseits. I was surprised this was One Direction. Decent track, but became boring. sie beweisen das sie singen können!! doch ist einfach zu langweilig! It sounds exactly like Ed Sheeran but there's something missing here. Attention starts to wane a little near the end. Okay ballad, but some of the lyrics in the first verse are strange, and hearing the guys singing the lyrics "let these little things slip out of my mouth" sounds awkward. 2.75*. Is it fair to say that if this were song by any other group, it probably wouldn't sell as well? EDIT: Okay, I find this song incredibly boring now. 2.75* -> 2*. ▒ Van deze trage, saaie, ballads zijn er al duizenden !!! Dus daar kan deze plaat van de Engelse Boyband "One Direction", uit oktober 2012, ook nog wel bij !!! Alléén een hoogvlieger bij de verliefde dames tieners ☺!!! Niet slecht maar beduidend minder goed dan hun vorige hit singel. Geen hoogvlieger, maar zeker niet slecht! Van mij 4 sterren! This would not be out of place on +. I like the song okay, but it's not the best song from them and it's not close to the best Ed Sheeran song. Edit: It might nearly become my fave from them. It's okay, I don't really like those harmonies. Can't say this is bad apart from some of the lyrics just dull and boring and feels like it just ends making it feel like a non event. 5th UK top 10. 5 weeks UK top 10. 27 weeks in the UK top 100. 85,308 sold while at #1. Their third UK#1. 1 week top 10. World Chart#9. 625,000 copies sold in the UK. 1 million copies sold in the US. The biggest selling boyband single of 2012 in the UK. Their fifth biggest selling single ever in the UK. Can be a bit boring and does have incredibly cringeworthy lyrics, but despite that, I am liking this a lot more than "Live While We're Young". Great stripped back song, and a lot better than all the other boyband songs out there at the moment. In der Tat nur ein kleines Ding. Oh I really like it now. For shame. Louis is honestly the weak link in this band - he has to go!! Some of the lyrics get on my nerves but other than that, it's pretty good and one of their better ones I think. 4.5. Es gibt wohl kein männliches Geschlecht dem das gefällt. Wo kommt dieser Hype auf einmal her? Boygroups sind jetzt wieder in ... nix mehr anarcho (TH vor fast 10 Jahren), wieder alle schön brav mit Scheitel und so, 90s-Reloaded. Strange Teenie-Generationen-Entwicklung. Ach du Schreck! Ich muss Sacred für einmal von A-Z recht geben! vrij gemiddeld plaatje van One Direction. Wel goed om een keer een balad van ze te horen. Al met al goed voor 3 sterren. Like people will even remember these people let a lone this song in a few years. Himmel, ist das öde. Sowas von blutleer und wo ist die Melodie? Boygroups sind doch dafür bekannt meistens herzerwärmende Balladen zu bringen. 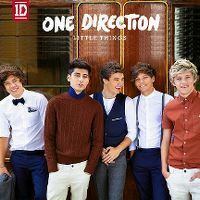 "Little Things" kann ich nur mit 2* bewerten. Mir fehlen hier zuviele Zutaten, die eine gute Pop-Ballade ausmachen. Langweilige Nummer, kann den Erfog absolut nicht nachvollziehen! Ach het is best aardig al mocht het wel iets spannender worden. Doch es gibt männliche Mitglieder den das gefällt.Dieser song ist echt wunderschön.Diese Jungs können wirklich singen. Rustige ballad van One Direction en opvolger van hun hit "Live While We're Young". Ook terug te vinden op hun album "Take Me Home" (2012). Misschien geen echte hoogvlieger, maar klinkt voor mij best OK.
Très beau morceau, malgré des paroles un peu cul-cul. On sent la trace d'Ed Sheeran. Ich frage mich wircklich, was an diesem ekelhaftem Gesäusel schön sein soll. Unerträgliche Gefühlsduselei, sehr unangenehm zu hören. No. Just no. Horrible vocally!! Awesome track... thanks to Ed Sheeran. Only giving it a 4* because the subject matter makes me cringe. Tyoical album filler. Should not have been released as a single. Song sounds o.k., I guess, but isn't going anywhere. Impact: nill. Never have really felt anything towards this pretty plain average song. Gehts noch langweiliger? Melodiearmut gepaart mit den nicht vorhandenen Stimmen der Jungs! Misschien wel het beste nummer van One Direction. Lekker rustig, en het lijkt niet op hun andere popnummers. Gelukkig maar ook! 4 sterren! P.S: Nooit gedacht dat ik een nummer van One Directon 4 sterren zou geven. What Makes You Beautiful gaf ik de meeste sterren. 2 sterren namelijk. One Direction blijft natuurlijk One Direction. 3 sterren voor de moeite..
Recht gefällige Nummer, die niemandem wirklich weh tut, jedoch leider etwas gar langweilig daher kommt... - knappe 4. So eine ruhige fast Unplugged Nummer ist doch mal was anderes. Dimples & freckles ... ja, gerne. Das hier nur ganz selten. It's terrible even for One Direction! Vocally and lyrically inept but it somehow manages. The 1D influence outweighs the Ed Sheeran influence in my opinion, and it's one of their least impressive efforts. 2.8*. Hätte der Song einen anderen Interpreten währe die Durchschnittsnote wohl einiges höher... Naja, ist eigentlich nämlich eigendlich eine ziemlich gute Ballade.